This message is what we want to spread as unity, togetherness & brotherhood suits a cadet's appetite as the best food. 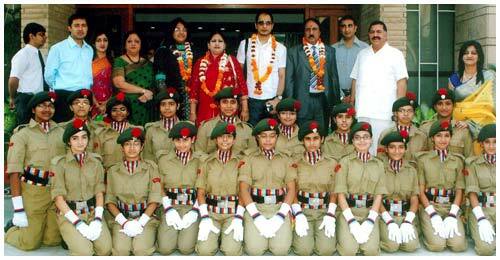 The National Cadet Corps is steadily marching forward to meet the leadership challenges of the 21st Century. Youth is the backbone of any country. On their delicate shoulders rests the difficult task of taking the country forward. The task is gigantic. For this, strong character building and personality development is imperative. N.C.C cadets are playing a major role in this area. Drill activity makes them organized and group activities teach them to exercise control over emotions. The task of N.C.C is, unending and in need for constant upgradation. There is no doubt that these cadets will work with renewed zeal 'n' devotion and achieve yet higher standards in the future. Rigorous Hard work & training will make the cadets shine brightly in future as they say that a good beginning makes a good end. Do your best & leave the Rest - this will prove to be the stepping stone of success for many more years to come.